M90 KFT is a two way compact speaker. 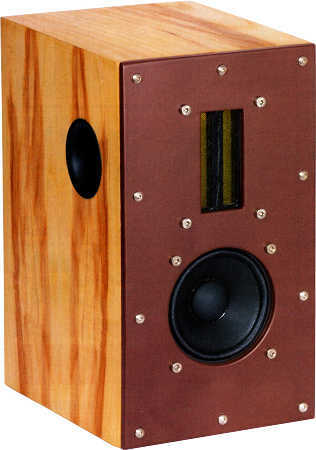 M90 KFT is a bass-reflex cabinet loudspeaker with drivers of Mivoc . - a 2nd order low-pass filter (12 dB per octave slope) for the midrange / bass driver. … The decay spectrum is nearly perfect. At 90 dB and 1 m, nonlinear distortions are below 1.3 % almost everywhere above 300 Hz. For the speaker you need additionally the following screws per speaker: 4 pieces cylinderhead screws M4x30 mm, 4 pieces cylinderhead screws M4x20 mm, 4 pieces of nuts M4, 10 pieces of chipboard screws 4x40 mm. The high-end kit is delivered with baked varnish air core coil on important parts of the crossover for minimizing microphonic effects. - The current flow through the coil creates a magnetic field which sets the reel of wire in motion. This motion induces a voltage in the coil which adds itself to the signal. The stiffer the reel of wire is, the less the signal will be altered. The capacitors for the fullrange driver are of type polypropylen (MKP) Clarity-Cap SA 630 V.
For the speaker you need additionally the following screws per speaker: 4 pieces cylinderhead screws M4x30 mm, 4 Stück cylinderhead screws M4x20 mm, 4 pieces of Nuts M4, 10 pieces of chipboard screws 4x40 mm.